The 'bible' of occupational health, Fitness for Work is the most in-depth and comprehensive resource available on the relationship between ill health and employment. The specialist advice given covers health hazards in the work place, fitness for work, and rehabilitation after illness or injury. A truly current source, it discusses the social aspects of work, and problems associated with our ageing workforce and changing population. Communicating occupational health advice to patients, employees, and doctors, Fitness for Work improves relationships in the workplace. It details the impact of a patient's health on work, and how they can be supported to gain or remain in employment. This invaluable source argues that in a suitable role, an employee can derive immense benefits to their health and well-being from work. Importantly, this comprehensive title also presents tactics on how to reduce inappropriate barriers to work for those who have overcome an injury or disease, and those who live with chronic conditions. 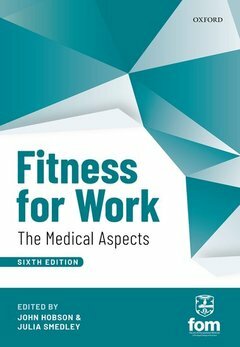 Fully revised and updated, the sixth edition of Fitness for Work is based on the latest research evidence and clinical advances. The first half of the book focuses on the general principles of fitness to work and occupational health practice, such as legal aspects, ethical principles, health promotion, health surveillance and general principles of rehabilitation. In addition, it advises on sickness absence, ill health retirement, medication, transport, vibration and travel. In the second half of the book, chapters are arranged by clinical speciality or topic, and are co-authored by a topic specialist and a specialist occupational physician providing a comprehensive view of the subject. For effortless reference, each specialty chapter outlines the conditions covered, their prevalence and impact, and discusses the clinical aspects and treatment that affects work capacity. All recommendations are evidence-based and make use of the NICE guidelines. The definitive text on the relationship between health and work, Fitness for Work delivers a wealth of valuable consensus guidance, codes of practice, and locally evolved standards. This highly-regarded resource is essential for all occupational health practitioners. John Hobson is a practising consultant occupational physician. He has been the honorary editor of the journal Occupational Medicine for over fifteen years. He holds academic appointments in occupational medicine at Keele, Manchester and Birmingham universities. Julia Smedley is an occupational physician, leading a large multidisciplinary OH service in the NHS. She has an active interest in research and innovation, service development and quality improvement and has contributed to national guidelines and audits in the specialty. She is an honorary senior lecturer at the University of Southampton.